← Libertarian commentary on the News, #14-38A: Insanity is catching. Good morning. I have spoken before about the lack of quality of work on the part of so many people today. Nowhere do we see that lack of quality more than in government. Several of the stories on which I’m commenting today show that “poor workmanship” in government (and elsewhere). New lab incidents fuel fear, safety concerns in Congress. These nasty incidents point out that the National Institutes of Health are just another big, over-paid, over-bureaucratic and incompetent government agency, and these labs (in Hamilton, Montana, Fort Collins, Colorado, and Memphis, Tennessee are a danger to themselves and people around them, just like most other government agencies are. There have been more than 1100 incidents in five years (2008-2012), with half of them requiring one or more lab workers to be hospitalized. How many more were NOT reported? How many more are waiting to be discovered like the 50+ year old diseases in a janitor’s closet that actually made the news several months ago? Ironically, almost 90 years ago, the lab in Hamilton was opposed by the people of the town because of the perceived danger when all it did was investigate Rocky Mountain Spotted Fever. Today? Anyone opposed would probably be immediately branded as a traitor, a terrorist, and a sympathizer with Al Qaida or Russia. The CSU labs in Fort Collins are in the middle of a city of 120,000+ people, part of the Front Range Urban Complex with nearly 3 million. The spread of either Burkholderia OR TB in that setting could trigger a massive epidemic that could sweep the world, care of DIA and Fort Carson and Buckley AF Base. And the H7N9 bird flu virus incident in Memphis was IN the Children’s Hospital: easy targets, no? Folks, government and government employees AS A GROUP just do NOT care. Their jobs, retirement, money, and power (and their own lives) are their priorities and sometimes ALL they care about. And their work is incompetent: sub-standard. It turns out that the three Afghani officers missing from Massachusetts and found trying to sneak into Ontario from New York are NOT the only ones: two Afghani police officers disappeared from Virginia last week and were picked up near Buffalo, NY. Of course, the Feds assure us that NONE of these people were a security risk or threatened anyone’s security or safety. Even though the major cause of death for US and NATO troops in Afghanistan itself seems to be getting killed by Afghani government soldiers or police. It was suggested that maybe they were trying to defect, even though Canada IS (still) a US ally. Here we can see all kinds of incompetence, even in these five Afghani soldiers, whom (if they were smart) would have laid low and planned better, or even gotten the training and taken it home with them. Mama’s Note: One of the problems with this kind of thing is the fact that we look for rational reasons and responses in these folks. We have to remember that their religious/political ideology nearly always precludes any sort of rational thinking, so it’s going to be very difficult to determine the reasons they act as they do. I suggest they all be sent home immediately. The taxpayers of America have zero responsibility to “train” these people. First Amendment? What is that? SWAT raid to shut down Twitter parody of Illinois politician was legal, judge rules Just to be clear: satire isn’t covered in Peoria, Illinois under the 1st Amendment. If you skewer a public official through parody, you are not exercising a right – you are slandering him. At least, that’s what a judge essentially concluded when he upheld a SWAT raid of a local mayor’s Twitter antagonist. 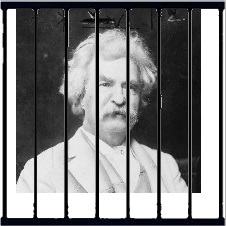 Mark Twain would have died in prison, if the SWAT team hadn’t killed him when he tried to light up a cigar. Freedom? Sorry, we’re Americans, we don’t need any of that stuff. Of course, it would be nice if we had judges that understood the LAW and not where their paychecks and perks are coming from. What is worse is that this Nazgul considers a Tweet a justification for an armed invasion of a home. Last week, Ron Paul writes, Congress voted for more war in the Middle East. … the House and Senate voted to rubber stamp the Fuehrer’s war plans for the Middle East. Both bodies, on a bipartisan basis, authorized the U.S. to begin openly training and arming the rebels who have been fighting for three years to overthrow the Assad government in Syria. Never mind that they consider America to be the Great Satan, never mind that if not as bloody as the Caliphate, their hands are dripping red. Never mind that Assad is as close to a secular regime as can be found in the area. Congress is cowardly in their actions and needs a spine transplant: as I’ve said before, the Senate stood up to Augustus more than this pack of 435 hyenas does. John Kerry blames mass jihad murders on water supply. No, not the contamination but the lack of water in the Middle East. One day after Secretary of State John Kerry told a House Committee that ISIS is the ‘enemy of Islam’ he told an audience that people are killing each other all over the world because of a lack of water. He knows his environist propaganda far better than history: the Middle East has always had a shortage of water, and today’s fights are not about water, and water isn’t even an excuse. Mercedes-Benz put the future on display with a self-driving truck in Hannover (Germany). With Daimler Truck’s Wolfgang Bernhard behind the wheel, the self-driving Mercedes-Benz Future Truck 2025 made a dramatic entry rolling into an airport hanger for its introduction at a 500-guest international press conference and dinner. The concept truck integrates a range of new and existing technologies to create a heavy truck capable of fully autonomous operation from a full stop up to highway speeds. This will, of course, put paid to hundreds of thousands of jobs, while creating more. One reason is that accidents with trucks are increasingly due to operator error and not mechanical failure, and of course, the insanely increasing cost of human salaries, “benefits” and mandatory requirements. But we can expect that the entire process will take decades, in large part because of governmental interference. Not to mention unions. An example of that is found right here in the US, where BNSF wanted to eliminate the conductor position on most trains, reducing the crew to one. The union, of course, objected, and after years of negotiations, BNSF has given up for now. Mama’s Note: I don’t know that it’s such a good idea myself. Computers can’t actually think, or make moral judgments to start with, and they are far from perfect either. My ISP went down this morning, briefly, for no apparent reason. I can only imagine how horrible it would have been if the computer that failed was in control of an 18 wheel truck going down a highway at 65 MPH. As for the trains, it would seem that two people would be a minimum. What if one person had a heart attack or otherwise became incapacitated? Could the train run itself and avoid all hazards? Everyone and everything needs a backup of some kind, especially when the lives and property of so many others are at stake. Well, how about a piece of GOOD news related to “incompetence?” The 113th Congress is likely to yield fewest laws in six decades. With only a lame-duck post-Election Day mop-up session left before a new Congress takes the oath of office in January, the 113th is on track to be one of the least “productive” Congresses — in terms of laws passed and signed by the president — in 60 years. Praise be for small blessings. Of course, the ratio of bad legislation to “good” legislation (I suppose there IS such a thing, even today) is worse than ever. Still… count our blessings. Which brings me to the last article this morning. Wayne Allen Root, that frustratingly active cheerleader for all kinds of things, has recently published a ten-point plan for healing the American economy, with a summary available on PersonalLiberty.com. From a minarchist, conservative-libertarian point of view, these make sense, and I am sure he is writing to sway relatively conservative GOP types, and that the likelihood of even ONE of the ten planks getting adopted by either house’s Republicans is absolutely zero. But Wayne’s list is based on an absolutely FALSE assumption that the decision makers and bureaucrats and enforcing thugs of government are capable of actually implementing ANY of these things. They will fail even if they try, because the devil is in the details. Wayne’s suggestions, limited and minarchist as they are, would go a long way to restoring liberty and freedom to the Fifty States, but they will NEVER get an opportunity to do so. And the idiots that ARE government (not “infest” government) will be incapable of doing any of them. Mama’s Note: And furthermore, what so many people don’t seem to understand is that no non-voluntary government has any legitimate authority to do any of these things… or anything at all. People can authorize anyone to do anything they wish if it affects only themselves and others who consent, but they have zero authority to dictate to anyone else – regardless of motives or intentions. This entry was posted in Commentary on the News and tagged bureaucracy, Congress, Free Speech, Home front, Islamic wars, religion, self-driving trucks, Stupid government tricks, Wayne Allen Root. Bookmark the permalink.